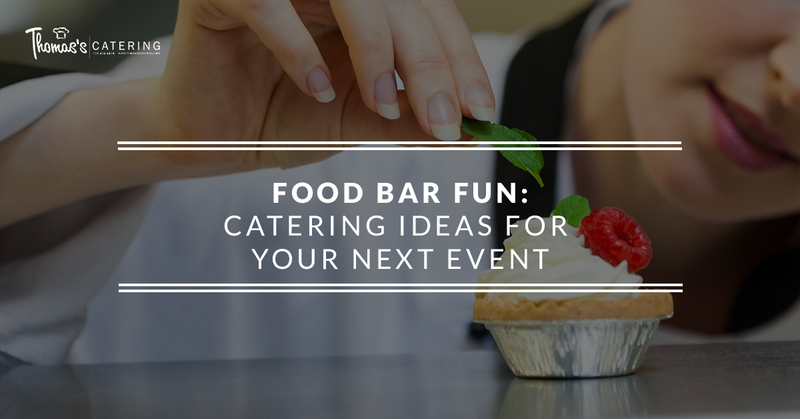 One of the hottest trends in the world of catering right now is self-serve food bars. These fun stations allow guests to make their own plate according to their preferences. Not only are food bars a fun and unique way to serve food during an event, but it also allows guests to completely customize their food to their desires. Additionally, it is more interactive, creating a conversation topic for guests and allowing them to more freely mingle. If you are looking to cater an event in Livonia and are interested in trying a food bar, Thomas’s Catering can help! Not sure what theme you want your food bar to be? Read on for some fun ideas. Are you hosting a breakfast event? Whether it is a bridal brunch or a baby shower, you can take your breakfast party to the next level with an omelette bar. This tasty and satisfying meal can be customized in so many different ways that it is perfect for a food bar. Omelette bars should feature a diverse range of ingredients. Beyond the most important ingredient, egg, we can stock your omelette bar with toppings that are sure to please a variety of palettes. 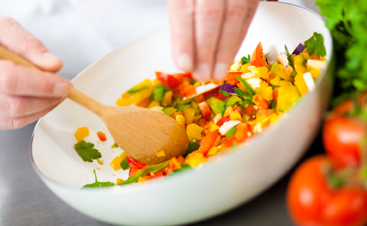 Different shredded cheeses such as swiss, cheddar, and pepper jack, as well as a variety of veggies such as spinach, mushrooms, peppers, tomatoes, and onions will make your omelette bar appealing to people with different dietary restrictions, but we won’t forget the meat lovers either! 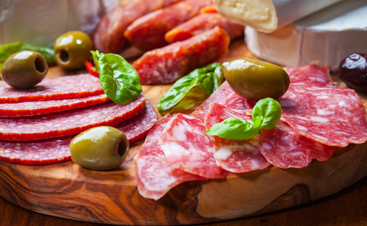 We can also offer a selection of breakfast meats like sausage, bacon, and ham. Offering herbs and spices for some additional flavor like salt, pepper, basil, and chives will make your omelette bar that much better. Everyone loves grilled cheese sandwiches, the food of comfort and childhood memories. Not only is grilled cheese simple, it is extremely versatile. All you need is bread and cheese, but from there, the possibilities are endless. For example, we can offer different types of bread, from whole wheat to pretzel buns to croissants. Of course, it is also essential to have an extensive offering of cheeses, from gouda to goat cheese and everything in between. Including toppings is also an option, and condiments are a must, so we can include things such as tomato, bacon, ketchup, and hot sauce to please all the palates. Those giant soft pretzels that remind you of baseball games from childhood are a great option for a food bar because they are so versatile. One way to create a pretzel bar is to have one side for sweet pretzels and one side of savory pretzels. On the dessert side, jam, chocolate syrup, peanut butter, whipped cream, and caramel are all great options. Additionally, toppings like coconut flakes, chocolate chips, berries, M&Ms, and nuts will make the sweet teeth among your guests quite happy. On the other side of the table, we can include a variety of types of mustards, as well as deli meats and cheese dip. If your party is camping themed or you have more health-conscious guests, a trail mix bar is a fun and creative way to offer a snack. You only have to walk through the aisles of a grocery store to see how many different ways you can make trail mix. We can include a variety of nuts and seeds, such as almonds, cashews, pistachios, sunflower seeds, pumpkin seeds, and peanuts. Dried fruits such as cranberries, raisins, bananas, and mangoes are also tasty options for a trail mix bar. Of course, additional toppings for the guests who are less concerned about their waistline can include various types of candy such as M&Ms, yogurt chips, chocolate chips, and gummy bears. Potatoes also lend themselves well to food bars because they are so versatile. Everyone loves potatoes, but they all have different ways they prefer to eat them. That is the beauty of a potato bar: every guest can customize their tater as they like! We can include a selection of different styles of serving potatoes, such as French fries, mashed potatoes, baked potatoes, chips, and wedges. On top of that, we can feature variety of condiments and toppings that are popular among potato lovers, such as ketchup, sour cream, shredded cheese, bacon bits, and chives. If you are looking for something to serve at breakfast time that is sweeter than an omelette, donuts are your best bet. Donuts come in so many different shapes and sizes, as well as different flavors and with different toppings. We can offer a selection of types of donuts, such as plain, glazed, chocolate, cream-filled, and more. Then we can offer toppings, such as sprinkles, chocolate syrup, nuts, and honey. We could even get a little crazier with toppings like nutella and even candied bacon! At Thomas’s Catering, we love providing the delicious event catering you need for your parties in Livonia. If you are in search of a caterer, we are committed to providing delicious, creative food choices for you and your guests. 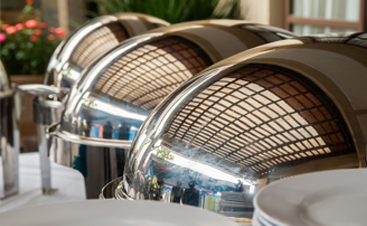 Contact us today to learn more about our catering services!